When a small quantity of business cards or brochures will do, why waste money on a large printing run? Full-color printed documents deliver your message with visual impact and maximum appeal. Just bring us your ideas, originals, or camera-ready art, and we can print your document. With our state-of-the-art variable data printing (VDP) technology, we can use your customer mailing list or customized client database to create pieces—letters, invoices and full-color postcards, etc.—that are personalized to each individual recipient. From posters to oversized CAD drawings and every large format document in between, PDQ will make sure your project is just what you need - full-color, black and white, a few single page copies or even high volume, multipage sets – PDQ can do it all. From order processing and production to kitting and distribution, we will fulfill your needs in a whole list of ways. We know that neat trims, accurate folds and professional binding are as important as the print quality that comes from our web offset/sheetfed and digital print areas. Therefore, our binding and finishing experts also take great care in executing these final touches on all your projects. 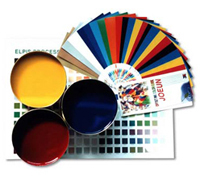 PDQ offers the latest in bindery and finishing processes to round out the production of your printed documents.